Welcome to our Student Unions! Welcome to the Student Unions homepage. Browse around our site to see how to reserve space in our buildings, what services we can provide, what Student Affairs and Academic Departments are housed here, and contact information if you can’t find what you are looking for. We hope to see you in the student unions soon! Hail to Pitt! *Note during the school year the reservations office is open until 7pm on Monday and Wednesday. Located in the heart of our bustling campus community, our Student Unions offer you safe, welcoming, and convenient spaces to relax, study, socialize, and more. Whether you’re looking to grab lunch, a quick workout, or some quiet study time, you’ll find what you need at either the William Pitt Union or the O’Hara Student Center. Our goal is to help you feel at home and do what you love. Does your building have free wifi? 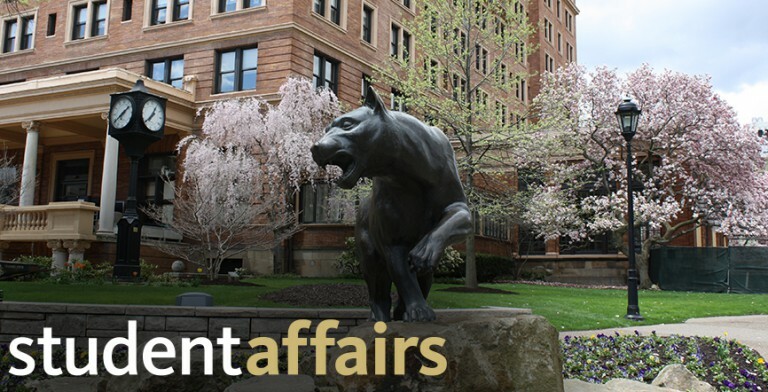 If you are a current Pitt student, faculty, or staff member you can connect to the Pitt wifi. If you are not a member of the Pitt community, the event host must sponsor wifi by contacting CSSD prior to the event date. CSSD can be reached at 412-624-4357. Where can I have parking validated? Parking is not validated unless prearranged by an event sponsor. For Pitt Starts, parking can be validated at Panther Central in Towers lobby. Can I park in the William Pitt Union driveway? The William Pitt Union offers a 15 minute drop off and pick up courtesy parking in the driveway. Guests must register the make, model, and license plate number of their car at the Information Desk. Long-term parking in the William Pitt Union driveway is prohibited. Any parking tickets issued to sponsors, performers or guests are their own responsibility. Parking arrangements are the sole responsibility of an event host and should be coordinated with Parking and Transportation Services. Where can I get a Port Authority Connect card? United Check Cashing – 3711 Forbes Avenue. To find other locations, visit http://www.connectcard.org/connectcard-locations.aspx. Can I take the bus for free? Anyone with a Pitt (Oakland) ID can take the bus for free. All Port Authority routes and fees can be found at http://www.portauthority.org/paac/. I'm looking for a specific building, where can I find it? To view the campus map, click here. Where can I go to get food on campus? You can find more information about our dining services here. I lost something at an event last week, will it still be there? For help with lost items, see our Information Desk. Can I use the pianos in the WPU or OSC?